Kay first started training at the age of 10 in his home town of Surin, north-eastern Thailand. He started fighting soon after and quickly gained a reputation on the local circuit as a strong fighter, winning many fights by knockout. Moving to Bangkok at age 17 to train at the famous Kiatsingnoi camp, where he trained alongside TMT trainer Nai for the rest of his career. Kay made his bangkok debut at Rajadamnern stadium in the 100lb division, and then moved up the weight divisions before eventually becoming a superstar of Onesongchai, the biggest promoter in Thailand fighting regularly at Lumpinee stadium on national broadcast television. During Kay’s prime he fought the biggest names in Muay Thai of the day such as Orono, Attachai, Thongchai, Chatchai and Yokthai Sitor. Competing during the “Golden Era” of Muay Thai, Kay defeated many of the champions of that time and rose up the rankings but unfortunately was never given a title shot. Kay retired from fighting at the age of 27, with over 250 fights and 17 years worth of competition. 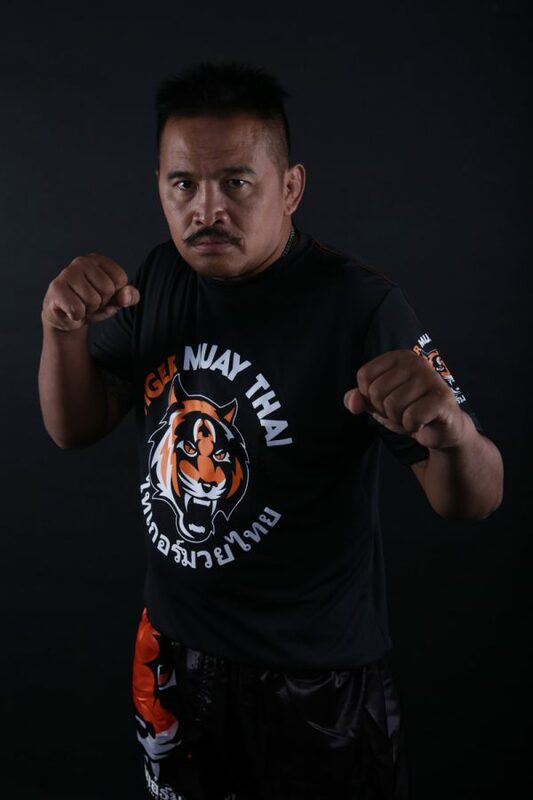 After retiring he quickly began training fighters in Bangkok and Surin where he brought up champions such as Iquezang Kor.Rungthanakeat. Soon after Tiger Muay Thai opened, Kay was recruited to join the training team and has been here ever since. Having trained many of Tiger’s top fighters for years, Kay now has the position of fight manager. He arranges fights for TMT fighters in the local stadiums, Bangkok stadiums and overseas. Kay is known for his relentless training style, focusing on building power and stamina in his students.